Google’s new Cloud Run service is a serverless platform built on Knative, the runtime environment that extends Kubernetes for serverless workloads, and the Functions Framework, which Google is also open sourcing for Node.js 10 today. But unlike other serverless functions where you typically bring code written specifically to run as a function and be triggered by events, Cloud Run lets you package up existing code in a Docker container. That container can run in the fully managed serverless Cloud Run environment, but because it’s using Knative it can also run on Google Kubernetes Engine, so you can add on-demand, pay-as-you-go code to your existing Kubernetes clusters. The idea is to improve and simplify the developer experience, and he expects that some organizations will use a mix of serverless and GKE deployments for Cloud Run for different developers. 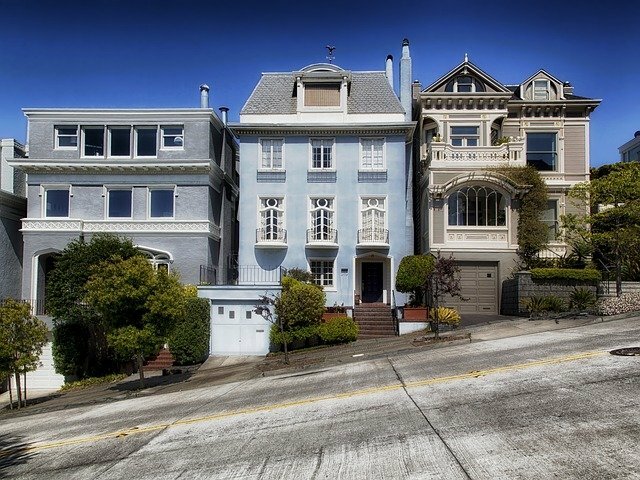 The code you can deploy to Cloud Run needs to be a stateless HTTP container that listens for requests on a port that will be configured as (but should not be hardcode as) 8080, starts an HTTP server within four minutes of receiving a request, responds within the request timeout, and is compiled for 64-bit Linux. “Your container should not rely on local state,” Steren Gianni of Google’s serverless team explained in a session at Next. “You can use consistent storage like databases and cloud storage but inside a container you can only rely on temporary state. The thing you create will not necessarily be there next time you invoke the container.” The limitations are specified in the container runtime contract. If you don’t already have your code in a container, you build it in the usual way and put it in the container registry. 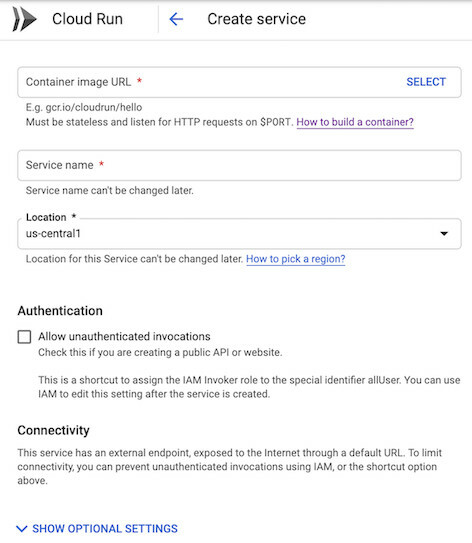 Deploy the container to Cloud Run by pasting in the URL of the container registry and what you get back is an HTTPS URL. Google demoed Cloud Run with a Python script calling LibreOffice (a Java binary) with a Python script, installing fonts and using Flask to convert Word documents to PDF; that added up to a 2Gb container that deployed in seven seconds over conference Wi-Fi and took ten seconds to start but then processed a thousand PFDs in a minute. This is a stable HTTPS URL that you can expose to the internet, if you want to use it for a web site or an API endpoint or a mobile backend or a Webhook. Or you can use it internally to refactor a monolith into microservices that scale independently. In Cloud Run, the container runs on top of the gVisor sandbox that Google open sourced last year as an optional replacement for the default Kubernetes runc runtime. That does limit what Cloud Run can run because it doesn’t support all the Linux system calls, but Teich says that in practice this is rarely a problem. “There are a few odds and ends that you might hit but the reality of what we see for customers is that as long as they are stateless HTTP containers [they run] … Every time we’ve found a rough edge, it’s usually very, very quick for us to fix it.” If your code does have issues in gVisor, Cloud Run on GKE doesn’t use a container sandbox. There are other limitations that might make Cloud Run on GKE a better choice for some workloads. Cloud Run allocates a single vCPU to a container and you can’t change that; if you want more control over resources, Cloud Run on GKE lets you choose more machine sizes and more RAM and CPU or use custom machine types, including GPUs and TPUs for acceleration. Workloads can run side by side with the existing cluster workloads and they also have access to the VPC and the Compute Engine networks. Cloud Run on GKE has the same autoscaling, including scaling down to zero, but it isn’t pay for use in quite the same way. The price (which hasn’t yet been published) comes out of the GKE resources you purchase (and you can use the GKE usage metering to charge that on to internal users). 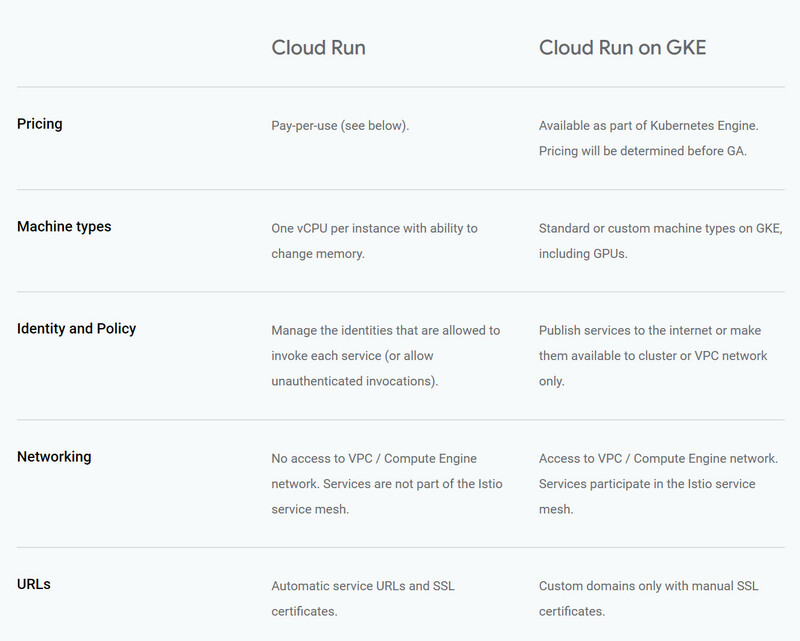 Because Cloud Run is built on Knative, using the Kubernetes Custom Resource Definitions that provide the necessary abstractions, you could start by containerizing an existing application and running that on its own, then move it to GKE to run as part of a Kubernetes deployment without needing to repackage it; you just choose the GKE cluster as the location in the Cloud Run console when you fill in the URL of the container you want to run instead of picking a Google region. Because it’s Kubernetes underneath, Cloud Run can take advantage of the Kubernetes ecosystem. Cloud Run integrates with Stackdriver for monitoring and logging, but you can also monitor with Datadog (using the Datadog agent for Cloud Run on GKE and the standard Google cloud monitoring APIs on the fully managed version), or use NodeSource’s N|Solid runtime for Cloud Run on GKE to get real-time performance metrics and custom notifications for Node.js code. If you’re experimenting with Cloud Run on GKE, it’s worth noting that you can’t disable Cloud Run on GKE in the beta service; to stop it running you have to delete the cluster, so pick a non-essential cluster to try it out on. And if you don’t have an existing application that you want to try on Cloud Run, StackBlitz is working on integration so you can use its one-click system to create a new app, GitHub repo and Cloud Run endpoint, ready to start coding and testing. Initially, Cloud Run is only available in US regions, but Google says it will be coming to European regions soon. Google introduced Cloud Run during its annual Google Next conference, held this week in San Francisco. The Cloud Native Computing Foundation, which manages the Kubernetes project, is a sponsor of The New Stack. Google paid travel expenses for the reporter to attend Google Next. Feature Image by David Mark from Pixabay. Other images courtesy of Google.